By Gordon Frickers 50 x 81 cms (20″ x 32″), Oils, available. SS Emerald Seas is beautifully shown here entering Government Cut, the final approach to the port of Miami. 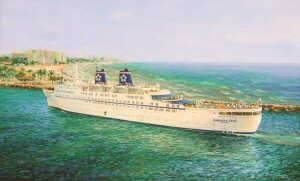 A very personal painting, I, Gordon Frickers sailed on this ship from Miami in 1989 with a group of passenger ship enthusiasts. I enjoyed my cruise, the cabins were spacious, the old ship spotlessly clean, the food good and ambiance relaxed.